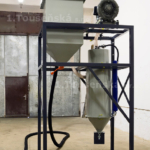 Abrasive Delivery System – 1.Toušeňská s.r.o. 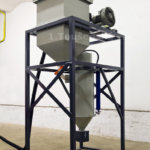 Installation of pressure units directly under the hopper may become problematic with larger cabinets TTB 120 – 200 and some other special cabinets; one of the possible solutions to this problem is the placement of the hopper on a platform. However, a bit more elegant, convenient for an operator, and space-saving solution is the use of abrasive transport unit. Here we are dealing with a separate device equipped with pressure blast unit, vacuum ventilation, filter, abrasive storage hopper, and cyclone separator. 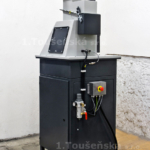 This device is attached to the cabinet and absorbs used abrasive from the bottom of the hoper. 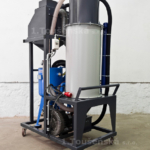 Cleaned abrasive material is gathered in a storage hopper and dosed into the pressure sandblasting tank, from where the blast hose runs to the box. To sum up, the abrasive cycle is closed as it is with classic placement of the blasting tank under the cabinet. 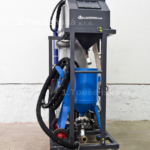 A special bonus, though, is a better quality of abrasive cleaning form dust particles.